Veteran actor Anupam Kher will soon be seen playing the role of Dr Manmohan Singh in The Accidental Prime Minister, and the actor is trending a great deal for his striking resemblance to the former Prime Minister. 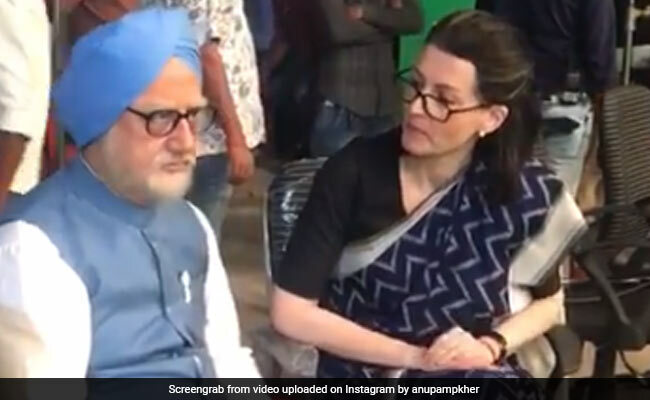 A BTS video of Anupam Kher dressed as Dr Manmohan Singh sitting with Suzanne Bernert, who is playing the role of Sonia Gandhi in film, hit the Internet recently, prompting the 63-year-old actor to share it on his Instagram timeline. Anupam Kher hashtags also suggest that the particular video is from the last day of The Accidental Prime Minister shoot. "On the sets of The Accidental Prime Minister somebody quietly shoots a candid moment between Suzanne Bernert playing Mrs Sonia Gandhi and I having tea and biscuits and shares it on social media. Now it is already on TV channels. So the best option is to share it myself. So here it is. Enjoy," he captioned the video. German-born actress Suzanne Bernert, who has earlier acted in Bollywood films and Tv soaps including Honeymoon Travels Pvt. Ltd and Yeh Rishta Kya Kehlata Hai respectively, also shared the video on Instagram. Earlier, a video of Anupam Kher walking like Manmohan Singh on the sets of the film in UK recently went crazy viral, which prompted the actor to share the video on Instagram. He also revealed that the video was from when he was rehearsing for a shot in UK's Broughton Hall Estate. Anupam Kher is continually updating fans with photos from the sets of The Accidental Prime Minsiter. Remember the photo shared by the veteran actor, which featured himself dressed as Manmohan Singh with co-stars Arjun Mathur and Aahana Kumra? Also the photo featuring the "entire political cast" of The Accidental Prime Minister? The Accidental Prime Minister is a political drama based on the life of former Indian Prime Minister Manmohan Singh, in which Anupam Kher is playing the titular character. The feature film is inspired from a book written by Sanjaya Baru. The film directed by Vijay Ratnakar Gutte.